This is the premise of Laini Taylor’s Daughter of Smoke and Bone. It does get a lot more complex than that, but this is an adequate summary for the purpose of this review. From the outside, Daughter of Smoke and Bone is an attractive book. Of course we shouldn’t judge a book by its cover, but lets face it, we all do to an extent – the attractive hardback edition of Daughter of Smoke and Bone sat on my bookcase for a few days, calling to me to get stuck into it. I have been lured in by pretty covers promising more than the book inside could deliver though, so while I admired the cover, I planned to wait until I was well into the book before passing judgement. The best laid plans seldom pan out though – I was judging Daughter of Smoke and Bone pretty early on. Fortunately, it was a favourable judgement – I was hooked. The hints of a secret life and strange characters slipped into Karou’s “normal” life made me want to know more. Even once we met these strange characters, there were many unanswered questions, and of course more questions were thrown up for the reader and Karou as the book went on and she was plunged headlong into a world she realized she had only scratched the surface of in her childhood with Brimstone. The story is exciting, and grabs your attention. Karou is a good lead character, a strong young woman who doesn’t know who she is, but is determined to find out. The non-human characters she meets along the way are all somewhat enigmatic, never fully revealing themselves or their intentions. The divide between good and evil is heavily blurred in Daughter of Smoke and Bone. Brimstone and the other friends from Karou’s childhood are chimaera, which traditionally should be evil – but they are the closest she has to family and they have raised her with love. Angels should be good, but in Daughter of Smoke and Bone they are not clearly so. In fact, if I had to pick out who were the bad guys, I would probably say the angels. But it isn’t quite that clear-cut. 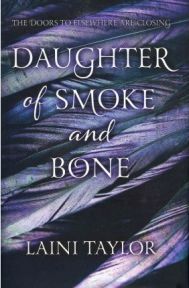 The story, setting and characters of Daughter of Smoke and Bone become quite complex and interwoven as the book goes on, particularly once some flashbacks become part of the story, yet not once did the story become bogged down in detail, even in the sections telling the history of the angels and chimaera. Taylor has a way of writing a fantastic story set in a completely formed world while making it seem perfectly natural and straightforward for the reader. Daughter of Smoke and Bone is the first in a trilogy, and given how full this first novel was, there is clearly a great deal more to come in Karou’s story. I was shocked and upset by the revelation which came close to the end of the novel, but I’m rather hoping that it wasn’t true, and that all will be resolved in the books to come. It is a beautifully written, well-crafted novel with a wonderful story, and although aimed at young adults, this is a novel for everyone which rises above age groups. Many thanks to Hodder & Stoughton for providing a review copy of Daughter of Smoke and Bone. No Comments on "Daughter of Smoke and Bone"